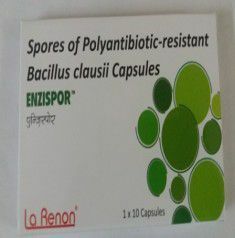 What Are The Uses Of Bacillus Clausii? Treats gastroenteritis, inflammatory bowel syndrome, diarrhea, irritable bowel syndrome (IBS), urinary tract infections (UTI), Crohn's disease. Increases production of immunoglobulin A. Prevents gastro-intestinal disorders, vaginal infections, and allergic disorders. What Are The Side Effects Of Bacillus Clausii? What Are The Contraindications Of Bacillus Clausii?